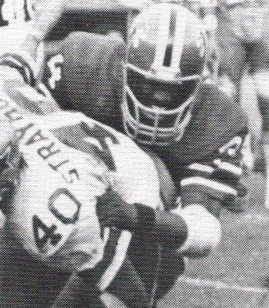 Brown was chosen by the Falcons in the sixth round of the 1971 NFL draft and started nine games at free safety as a rookie, intercepting three passes. He became part of a secondary that led the NFC in pass defense twice in three years (1971 and ’73) and finished a close second in ’72, the year Brown moved over to strong safety. In 1973 he picked off six passes and also returned 40 punts for a 9.0-yard average. Falcons went 3-11 to finish fourth in the NFC West while leading the conference in fewest passing yards allowed (1572) – but also giving up the most rushing yards in the NFL (2564). Brown was shifted to free safety in 1975 and had another fine season while he intercepted four passes and returned one for a touchdown. He moved back to strong safety for the next two years and was dealt to New Orleans in 1978, where he continued to be a solid performer. Brown spent three years with the Saints before retiring in 1980. Overall, he appeared in 137 games over ten seasons and intercepted 38 passes, 31 of them with the Falcons, two of which were returned for TDs.